001.Timati Feat. Snoop Doog - Get Your Groove On. 002.Pitbull - Hotel Room Service. 003.Jay Sean Feat. Lil Wayne - Down. 004.Flipsyde - When It Was Good. 005.Akon Feat. Billy Blue - Story Of My Life. 006.The Black Eyed Peas - I Gotta Feeling. 007.Kanye West Feat. Young Jeezy - Amazing. 008.Tinchy Stryder Feat. Amelle - Never Leave You. 009.Nelly - One And Only (Polow Remix). 010.Busta Rhymes - World Go Round. 012.K - Maro - Elektric. 014.T.I. Feat. Mary J. Blige - Remember Me. 016.Flo - Rida Feat. Ke$ha Cole - Right Round. 017.Kanye West Feat. Mr Hudson - Paranoid. 018.Kristinia Debarge - Goodbye (Main Version). 020.Jay Z - Death Of Auto-Tune. 021.Bbs Ft Lloyd-The Dedication (Ay Dj). 022.Busta Rhymes & Mariah Carey - I Know What You Want. 023.E Hood Ft Akon And T-Pain-Overtime. 024.Melanie Fiona - Give It To Me Right (Paul Emmanuel Full Edit). 025.Keri Hilson Feat. Timbaland - Return The Favor. 026.Wale Feat. Lady Gaga - Chillin. 027.Jadyn Maria Feat. Flo - Rida - Good Girls Like Bad Boys (Main). 028.Common Ft. Pharrell - Universal Mind Control. 029.50 Cent - Ok, Your Right. 030.Ciara & Missy Elliot - Work. 032.Kelly Ft Oj Da Juiceman-Superman High. 035.Kid Cudi Feat. Kanye West & Common - I Poke Her Face (Make Her Say). 038.Sean Kingston Feat. Pitbul - Fire On The Dance Floor. 039.Akon - Be With You. 040.Dizzee Rascal Feat. Calvin Harr - Dance Wiv Me. 041.Asher - Roth I Love College. 043.Risette Michele-Blame It On Me. 044.Bolous Ft Jeremih-Its My Time. 045.Kenny Babyface Edmonds - I Need A Love Song. 046.Alesha Dixon Feat. Scottie B - Truth - Breathe Slow (B.O.E Remix). 048.Enrique Iglesias Feat. Johnta Austin - Lost Inside Your Love. 049.L Kim Ft T-Pain And Charlie Wilson-Download. 051.Lionel Richie Feat. Akon - Just Go. 052.Ung Problemz And Mike Jones Ft. Gucci Mane-Boi. 053.Charlie Wilson - There Goes My Baby. 054.Ry J. Blige Ft Drake-The One (Main). 055.Bolous Ft The Dream-Throw It In The Bag. 056.Her Roth Ft Cee Lo-Be By Myself (Main). 057.Craig David And Nek - Walking Away. 059.Pleasure P - Boyfriend #2 (Ref 1 Remix). 061.Ama Ft. Yo Gotti Gucci Mane And Lonnie Mac-Ridiculous. 062.Ara-Like A Surgeon (Album Version). 064.Ironik - I Wanna Be Your Man (Uk Radio Version). 065.Gs Boyz - Stanky Legg. 066.Jay Sean Feat. Navin Kundra & Rishi Rich - Fade Away. 068.Ista Ft Erika Shevon-Wetter (Acapella). 069.Lmfao - La La La (On Top Of The World). 070.Boyz-Booty Dew (Road Manager Steve Mix). 072.Anggun Feat. Pras Michel - My Man. 073.Mie Foxx Ft Timbaland-I Dont Need It. 078.Shaggy Feat. Akon - What s Love. 079.M Jones Ft Ryan Leslie-Precious. 080.Ludacris Feat. T.I. - Wish You Would. 081.M.I.A. Feat. Jay - Z - Boyz (Radio Edit). 082.Jennifer Lopez - Hooked On You. 083.Rio Ft Gucci Mane And Sean Garrett-Break Up. 084.Ne - Yo - Mad (Radio). 085.Ashanti Feat. Flo Rida - Lets Do Something Crazy. 086.Coolio Vs Ennio Morricone - Change. 087.Madonna Feat. Kanye West - The Beat Goes On. 088.Chgirl-He Aint Wit Me Now (Tho) (Main Version). 090.Class Ft. Lil Jon And Pitbull-Im The Ish (Lil Jon Remix). 091.E Ting Tings-Thats Not My Name. 093.Michelle Ft Gucci Mane-Self Made (Main Version). 094.Keri Hilson Feat. Kanye West & Ne - Yo - Knock You Down (Radio Edit). 095.Janet - Heartache On The Dancefloor. 096.Ulja Boy Tell Em Ft Sean Kingston-Yamaha Mama. 097.Ciara & Missy Elliot - Work. 098.Airra Mari Ft. Flo Rida-Cause A Scene. 099.Chrisette Michele - Epiphany (I m Leaving). 101.Dakiss Ft Drag On-Whos Real (Ruff Ryders Remix). 102.Ri Hilson Ft. Trina And Keyshia Cole-Get Your Money Up (Main). 103.Ck Ross Ft The-Dream-All I Really Want. 105.E Alchemist Ft Maxwell And Twista-Smile. 107.E Clipse Ft. Kanye West-Kinda Like A Big Deal (Album Version). 108.Ino Ft. Swizz Beatz-Million Bucks. 109.T.I. Ft. Rihanna - Live Your Life. 110.Kevin Rudolf Ft. Lil Wayne - Let It Rock. 111.T.I. Ft. Justin Timberlake - Dead And Gone. 113.Kanye West - Love Lockdown. 114.Lil Wayne - Prom Queen. 116.Pitbull Ft. Lil Jon - Krazy. 117.50 Cent - Get Up. 118.Bby Valentino Ft. Yung Joc- Beep. 119.Dj Earworm - United State Of Pop 2009. 120.Chris Brown Ft. Keri Hilson - Superhuman. 121.Plies Ft. Chris J - Put It On Ya. 123.Pain Ft. Ludacris - Chopped N Skrewed Zomba. 124.Busta Rhymes Ft. Ron Browz - Arab Money. 125.T.I. - Whatever You Like. 126.Jamie Foxx Ft. T-Pain - Blame It. 127.Beyonce - If I Were A Boy. 128.Leona Lewis - Better In Time. 129. - Ulja Boy Tell Em Ft. Sammie - Kiss Me Thru The Phone Collipark. 130.Eminem Ft. Dr Dre & 50 Cent - Crack A Bottle. 131.Keri Hilson Ft. Lil Wayne - Turning Me On. 132.Ludacris Co-Starring T-Pain - One More Drink. 133.Sse Mccartney - Leavin Hollywood. 134.Jesse Mccartney Ft. Ludacris - How Do You Sleep. 135.T-Pain Ft. Chris Brown - Freeze. 136.Ms - Move If You Wanna Capitol. 138.On Ft. Lil Wayne Young Jeezy - Im So Paid Src Motown. 139.Ke Epps-How To Be A Gangsta. 140.Ck Ross Ft. T-Pain Lil Wayne And Kanye West - Maybach Music 2 (Album). 141.Magic System Feat. Khaled - Meme Pas Fatigue (Rai N b Fever 3). 142.Ipse Ft Pharrell Williams-Im Good (Album Version). 143.Ry J. Blige Ft Drake-The One (Inst). 144.Dakiss Ft. Swizz Beatz And Oj Da Juiceman-Whos Real (Album Version). 146.L Kim Ft T-Pain And Charlie Wilson-Download (Instrumental). 148.Risette Michele-Blame It On Me (Inst). 149.Bentley Ft. Anthony Hamilton-Greener (Instrumental). 150.Bbs Ft Lloyd-The Dedication (Ay Dj) (Instrumental). 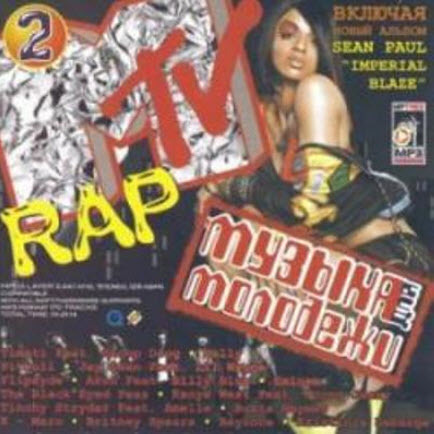 free download VA - MTV RAP - Music for Youth 2 (2009).VA - MTV RAP - Music for Youth 2 (2009) full from nitroflare rapidgator uploaded turbobit extabit ryushare openload littlebyte zippyshare.